Why? It is because few consumers have the equipment needed to do fast and high-resolution scans of documents of any size. Most don’t have the time either. After all, even if you could rapidly scan a few hundred documents in day, you would also have to sort and name the files and then ensure they were saved in the right file format before heading into the digital storage. This is just not a viable approach, and if you want to discard the documents after scanning, that adds another step and more time. 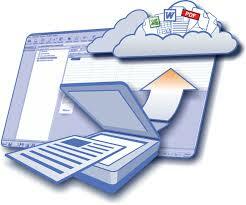 Fortunately, you can find providers of premium scanning services that do everything for you. They pick up the materials, sort them, scan them, save them as the file types you need, name them according to your criteria and then send them into a secure and private cloud storage or save them in the media of your choice. These collections of documents are searchable and easily used, making it the best way to scan and store documents for almost any. If you are eager to get started cutting down paperwork, contact eRecordsUSA to discuss your needs. eRecordsUSA is also specialized in providing Document Scanning, Document Imaging, Document Archiving, Digital Documents Archiving, Document Archival, Document Digitization and more. Would you like to receive a free quote for Best Way to Scan and Store Documents? Call +1.855.722.6669 or eMail us at info@eRecordsUSA.com.